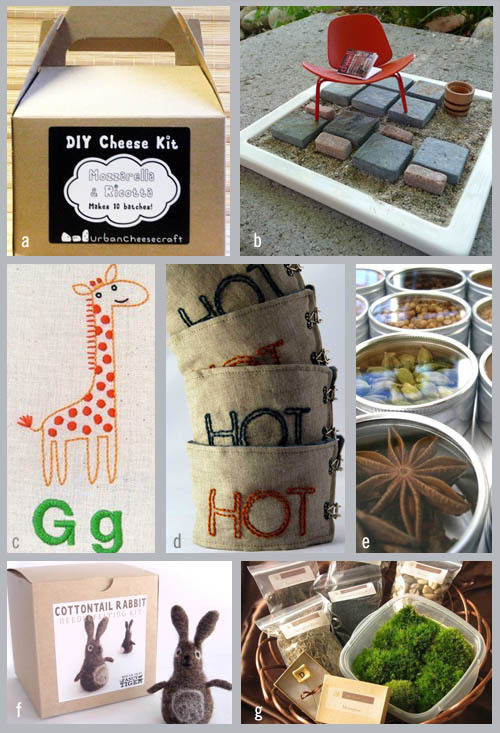 I thought it would be fun to take a peek through the archives and see what some of my favorite makers and crafters are up to now! Urban Cheese Craft is one of my favorite things! I love cheese and I love to make things! Perfect combination! I mentioned them a few times over the years in the blog! 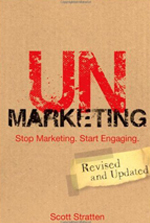 Its so fun and inspiring to watch a business grow! Even the packaging and photography style has evolved over the years! 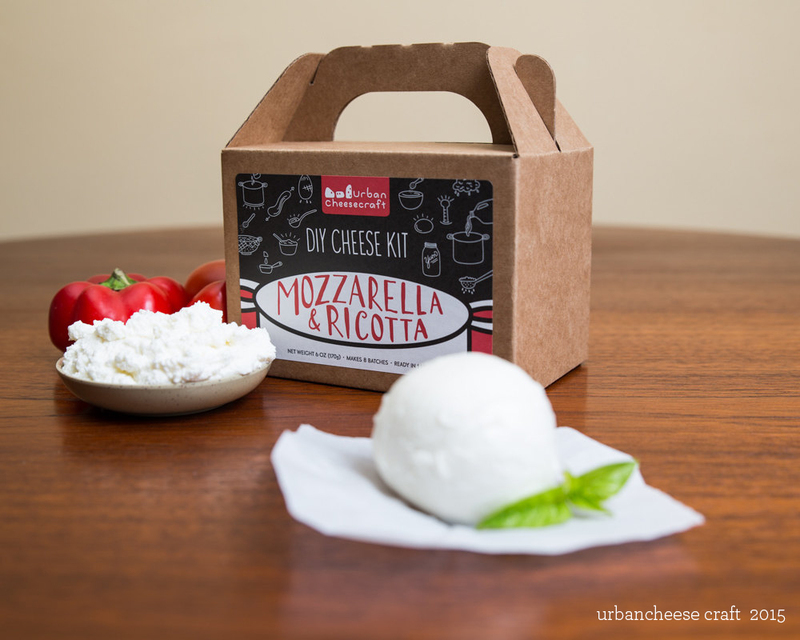 Today you can find an Urban Cheese Craft Kit in shops across the country! Pick one up for yourself! Or grab one online! Unless I have to spend the day entering receipts and invoice into quickbooks, my studio space is rarely quiet. In, fact I currently have three sources of audible entertainment in my tiny studio space (aka, spare room on the apartment), One Livio NPR radio, one portable turntable, and my computer. I tend to start my mornings Listening to the BBC News broadcast through WNYC, and then depending on what my tasks are for the morning, I will stay tuned into WNYC, or open iTunes or Pandora for a mid-morning pick-me-up. I have a very wide range of music tastes, depending on what I am working on, and if I need to be a little loud and active, or calm and focused. The Decemberists are my current go to sing-a-long sea-shanty fun-time go-to favorite. 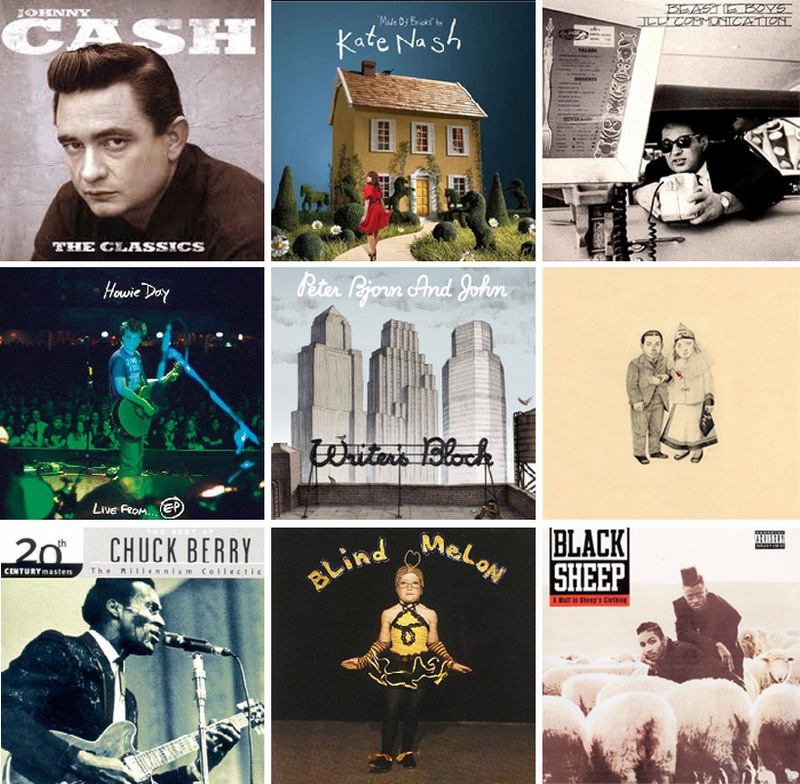 But I also love the classics, like a little Chuck Berry, Johnny Cash or Buddy Holly. I also have my guilty little pleasures, like the Howie Day version of Don’t Dream it’s Over, or my pandora station of just Disney songs, which can make any afternoon fly by. I really love having so much music at my fingertips and am constantly changing my playlists to suit the day. I came across this video today and my heart was filled with joy. This 98 years young graphic designer, Hal Lasko, lwas introduced to Microsoft Paint and his imagination and artistic talent filled the screen with wondrous art. I love being able to create new works with the aid of a computer, but I also love so much stepping back and picking up my pencils and paint to create something the old-fashioned way ( like Grandpa Hal during his first career). This video is just truly inspiring! And of course you can buy prints of his work on his website too! 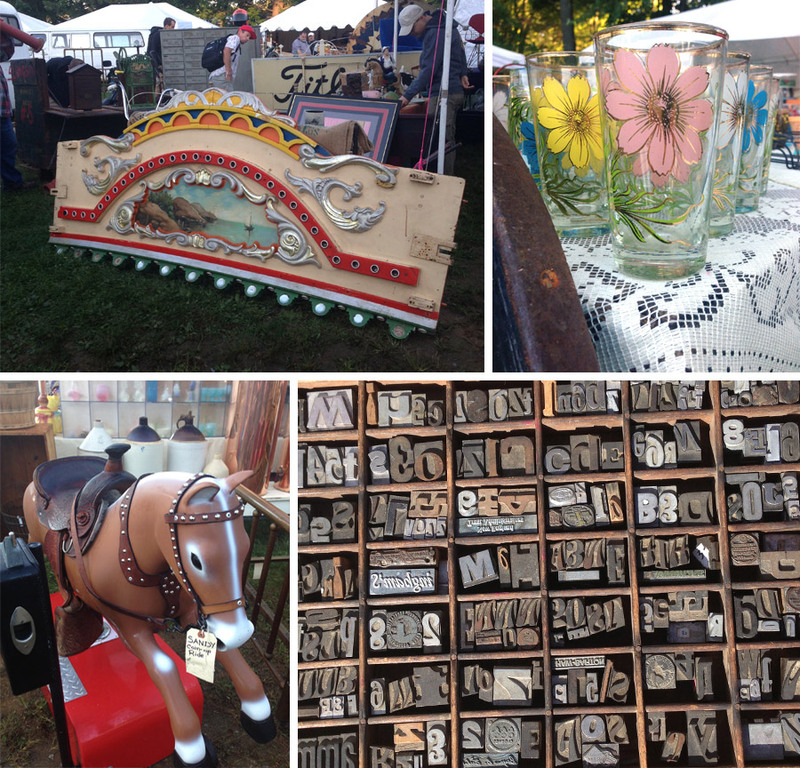 Yesterday I made my first trek to the Brimfield Antiques Show here in Massachusetts. I have wanted to go to this event for the last couple years and finally the stars aligned. When people tell you there is now way to see the entire show in one day, they are not kidding. This is huge, and I have the blisters and the sun burn to prove it. I left the house at 4:15am to make it to the opening of the New England Motel field at 6am. I ended up being about 10 minutes late (had to stop for some fuel for me and the car) handed over my $5 entrance fee and quickly began the hunt. There were a few things I was searching for specifically, and before two long I was able to check the first one off my list. Behold! 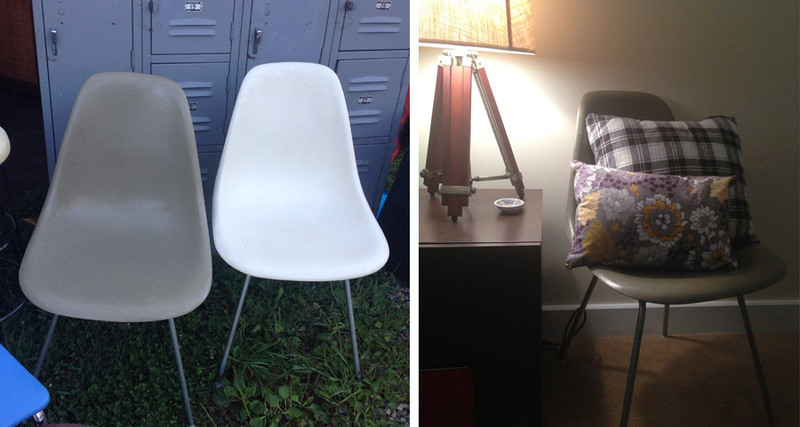 The eames chair. I have been wanting one of these for many years, but have never been able to find one in my budget that wasn’t an absolute mess! The color is perfect for our space and after just a tiny bit of bargaining the price was right and I carried it right to the trunk of my car. Unfortunately I forgot to put the battery in my camera before I left the house, but I did snap a few photos with my iphone. I can not wait to go back again in the spring and see what new treasures all the amazing vendors bring with them in May! I’m not making resolutions this year because I never keep them, but I did decide to setup some goals for myself in 2013. They aren’t groundbreaking or overly complicated, just 6 goals that I’m going to try to accomplish this year. 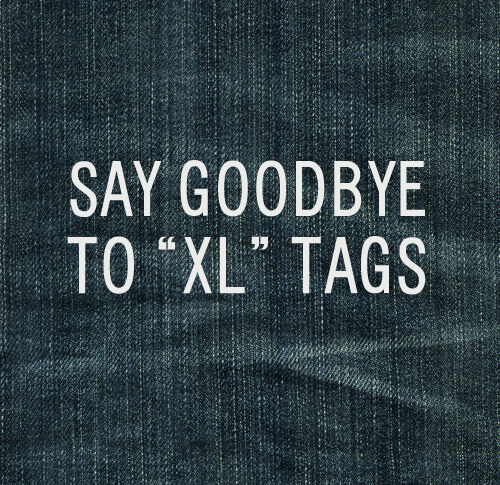 I really want to eat more whole foods, which goes hand in hand with saying goodbye to XL tags. 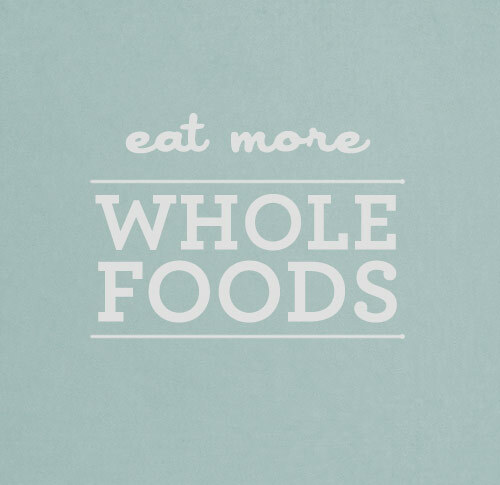 I don’t want to setup a goal of loosing a certain amount of weight, but rather aim to get back into a size Large. 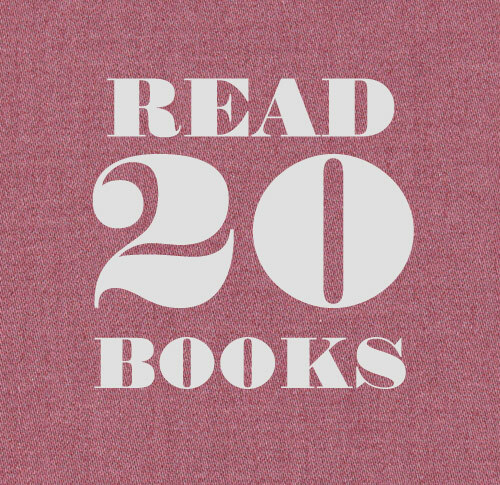 I’m going to read 20 books this year. In 2012 I read 13 books, but I also took 2 college english classes that filled a lot of my reading time. I always find all kinds of cool recipes and projects I want to try, and I pin them to my Pinterest Board and never make anything, this year s going to be different. 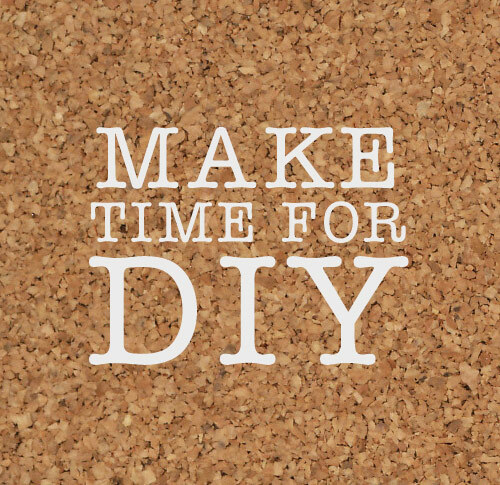 I’m going to make time for one DIY project each month. 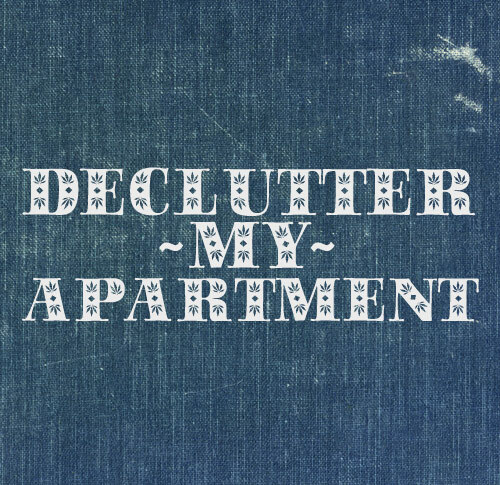 Declutter is a must, I’m so sick of “stuff”. And of course I want to take better photos. I got a new camera that I am very excited about, and need to read the manual because it’s a bit different than my last one. 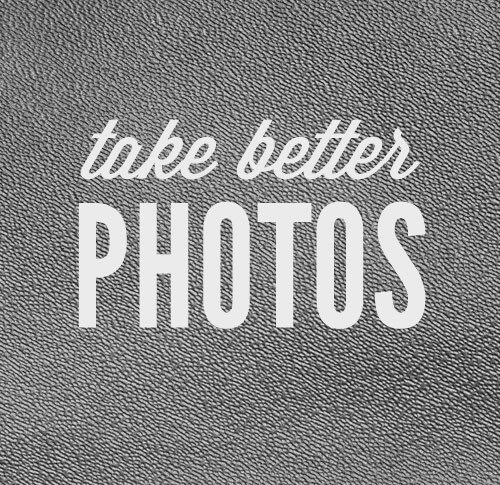 I want to learn more about photography and how to take a more meaningful and beautiful photo. So those are my goals for 2013, What are yours? Feel free to share them in the comments section! When I started peppersprouts back in 2009 I had no idea what I was doing. I really liked making things and loved that people were interested in buying what I was making. 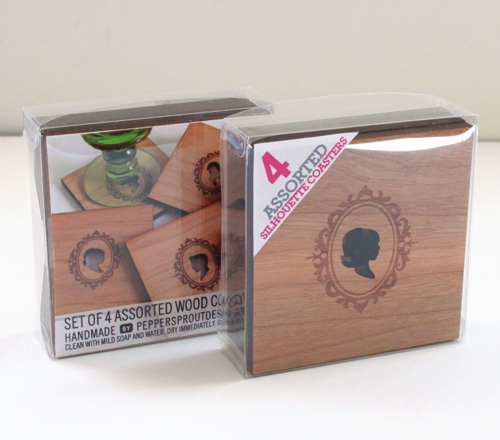 But of course, you need to have some sort of packaging for your work to be displayed in. I couldn’t use a belly band or tie my coasters up with string because the most important aspect of my very first coaster design was right in the center of the coaster. 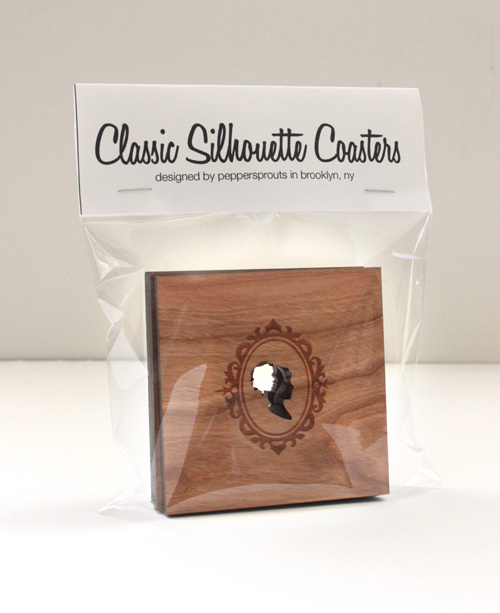 So I decided the best (and least expensive) way to package my coasters sets would be in a clear cello bag with an informational tag stapled to the top, as seen below. I knew this was pretty bare bones packaging. It was functional but not even a little bit appropriate for a store shelf. I decided they needed to be in some sort of box. While I no longer have the original kraft paper boxes I chose to use, this photo pretty much sums up the look and feel of the next iteration of packaging—super boring. Unlike the cello bag, you can no longer see the items inside the box, plus I had to stuff the box with tissue paper to make sure the coasters didn’t rattle inside the boxes. Not really ideal. I thought for a while, did a little research and decided I really needed a clear box. A box where you could see the beautiful designs held within. I lucked into finding a box that worked perfectly for my coasters. It was intended to be for wedding favors and was available in bulk. Perfect! 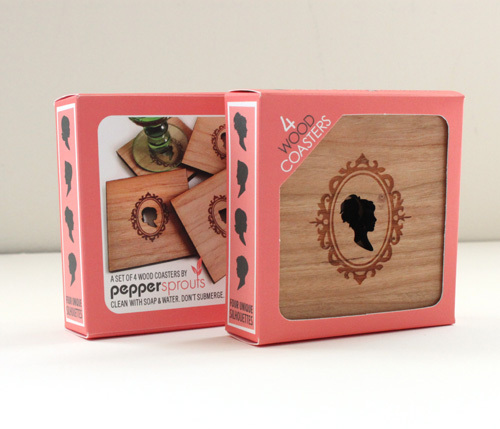 The first label I used was a wrap around sticker, so tere was a bit of information about the coasters whichever way you looked at them. I thought this new packaging idea was awesome. But after using it for about 6 months I decided it needed a little facelift as well. So I changed it up a bit. I kept the box. Color coded an exciting triangle label for each kind of coaster design (house, sillo, chairs) and added an information sheet inside the package so you could see the coasters in action; a sort of beauty shot to add some pizzaz to the overall presentation. I have been very happy with this packaging for the two years. You can see what you are buying, you get all the important information about the coasters and it stands up on its own. What more I could I really ask for? Then I started thinking: What if you could touch the coasters? What if you could take them out of the box and look at them without ruining the packaging? After all, these clear boxes were closed up with little circle stickers on the sides. I dug out my copy of the packaging Designers Handbook, and designed a box layout to hold my creations.I reached out to a number of printing companies who sent me personalized quotes and samples of packages they have printed in the past. 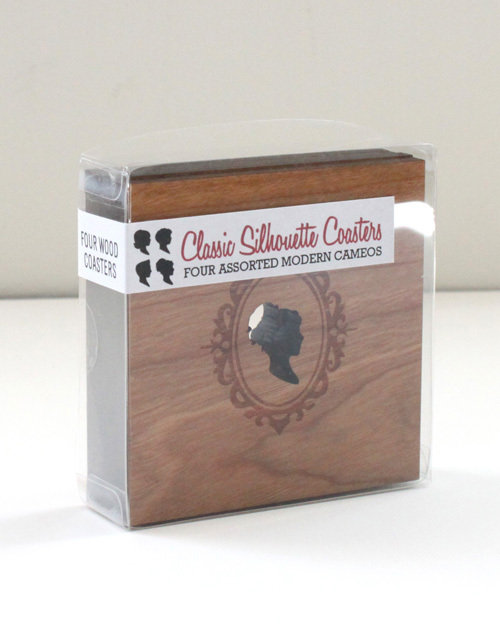 I wanted to make sure I was going to be able to afford to print my own packaging before I started to fully design them. 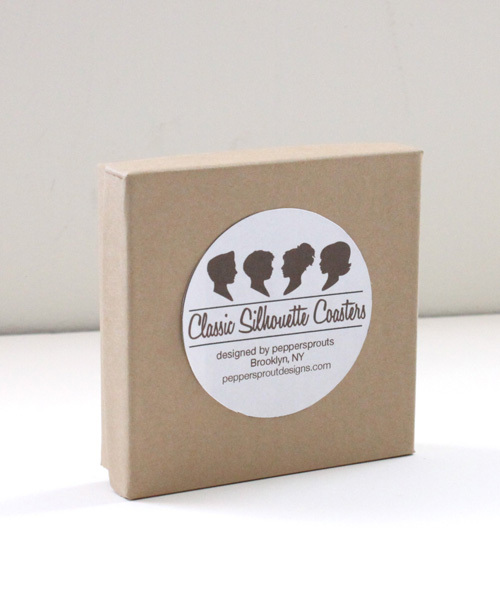 I fell in love with the branding, samples and awesome personalized attention I recived from Oliver Printing Co. This crazy idea was a go! I started designing this new little box. I added a cut out window on the front so you can touch the wood. The side panels show the silhouettes that are inside since each coaster is different. I decided on unique colors for each different coaster design, so they stand out from eachother at shows and on store shelves. And I kept the beauty shot of them on the back along with care information. 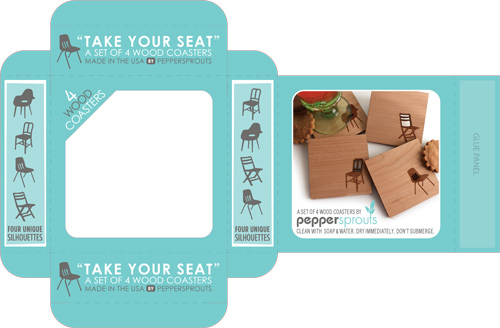 I am so excited to finally share with you the brand new packaging that now accompanies Peppersprouts wood coasters. It was so much fun making this project come to life, and I really couldn’t be happier! Just wanted to share a few ideas for when monogramed towel sets aren’t your style. 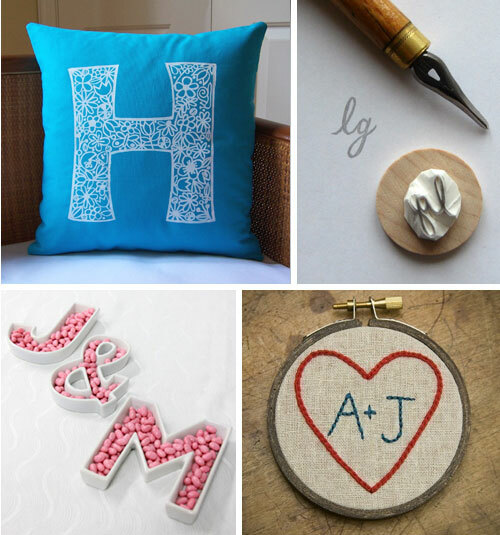 Clockwise from top left: Initial Pillow from Romp, Monogramed Stamp from lilimandrill, Heart Sampler from Miniature Rhino, Letter Dishes from Bridal Elements. my boyfriend was joking that i need a new project to work on, (I currently have 4 rather large projects going on currently, one of them is of course my product line.) But that got me thinking about all the great things that are available on etsy, and all the wonderful kits you can buy on there to learn a new skill, make something tasty, or just make someone’s day. I used to love getting craft kits to keep me busy in the summer months. So I took a peek at the vast pages of the etsy universe and here are a few of my favorites. 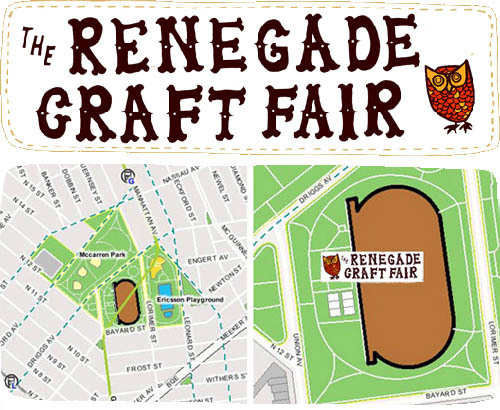 I’ve been really excited about the possibility of getting into the Renegade Craft Fair in Brooklyn this summer. I applied this year with my favorite soapstar (she makes soap she doesn’t star on the now canceled Guiding Light) Michelle from Dirty Loves Clean. The wait was long but last night we found out that we got in! I’m pretty excited, not only is it in my neighborhood, but I’ve always had a little mini-dream of selling there one year. I know some of my other favorite people also got in cakehouse, J Davis Studio, iKyoto, Miniature Rhino, and quite a few more that are all members of the newnewteam. So if you are in Brooklyn stop by and say hi, June 6 + 7th at McCaren Park. You may be wondering what these 3 things have in common. Wonder no more, they all relate back to me. 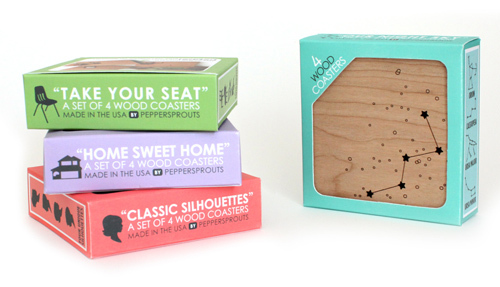 Aside from writing upstatefancy, i also work full time as a graphic designer and run peppersprouts on the side. What can I say I’m a very busy girl! Jessica from Miniature Rhino interviewed me for the newnew etsy team blog this week. So take a moment and stop by and read a little more about me and my creativity and daily life.